Acknowledgements: The Office of Institutional Research would like to extend a heartfelt thank you to all the personnel who supplied data and information for the Fact Book. 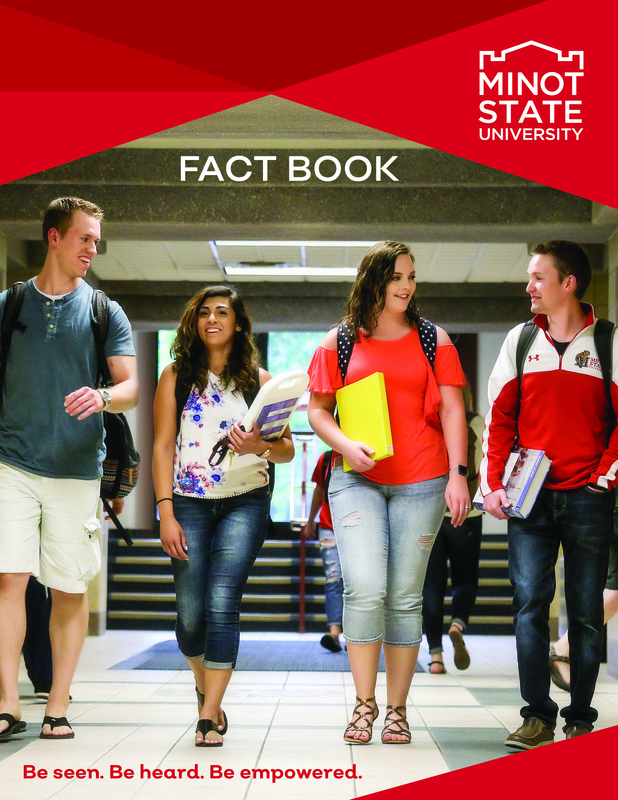 The goals of Institutional Research are to ensure that reports and analyses are accurate, timely and useful to Minot State University students, administrators, faculty and staff. To guarantee the mission is carried forward, the institutional research office works carefully to ensure that files dealing with student course and personnel data are as accurate and consistent as possible. Discrepancies should be reported to the Office of Institutional Research. The following definitions are taken directly from the U.S. Department of Education’s NCES/IPEDS Web site. For more definitions, use the IPEDS Web site. Degree: An award conferred by a college, university or other postsecondary education institution as official recognition for the successful completion of a program of studies. First-year: A student who has completed less than the equivalent of one full year of undergraduate work; that is, less than 30 semester hours (in a 120-hour degree program) or less than 900 contact hours. Freshman: A first-year undergraduate student. Full-time Equivalent: A measurement equal to one student enrolled full-time for one academic year. Total FTE enrollment includes full-time plus the calculated equivalent of the part-time enrollment. The full-time equivalent of the part-time students can be estimated using different factors depending on the type and control of institution and level of student. Full-time Student: Undergraduate — a student enrolled for 12 or more semester credits, or 12 or more quarter credits, or 24 or more contact hours a week each term. Graduate — a student enrolled for nine or more semester credits, or nine or more quarter credits, or a student involved in thesis or dissertation preparation that is considered full-time by the institution. Graduate: A student who holds a bachelor's or first-professional degree or equivalent, and is taking courses at the post-baccalaureate level. These students may or may not be enrolled in graduate programs. Graduation Rate: The rate required for disclosure and/or reporting purposes under Student Right-to-Know policy. This rate is calculated as the total number of completers within 150 percent of normal time divided by the revised cohort minus any allowable exclusion. Retention Rate: A measure of the rate at which students persist in their educational program at an institution, expressed as a percentage. For four-year institutions, this is the percentage of first-time bachelor’s (or equivalent) degree-seeking undergraduates from the previous fall who are again enrolled in the current fall. For all other institutions, this is the percentage of first-time degree/certificate-seeking students from the previous fall who either re-enrolled or successfully completed their program by the current fall. Undergraduate: A student enrolled in a four- or five-year bachelor's degree program, an associate's degree program or a vocational or technical program below the baccalaureate.